Offering 9 individual rooms and suites, each with a unique feel and character. Choose one to suit your stay as a couple, friends, family or colleagues. Solo travellers are also well cared for. Expect the facilities of a business hotel with the charm of artisan decor and the comfort of being at home. Gather your nearest and dearest. Celebrate in a memorable meeting place. Host your retreats and workshops in an inspiring stress free haven. Bonding and team building are fully supported by an abundance of outdoor and cultural activities. A unique setting of exotic, casual comfort suitable for your group of up to 24 guests. Thoughtfully designed for our independent guests seeking convenience and value. We take the hassle out. Recommending only the most worthwhile activities, excursions and cultural offerings. Be assured, we only collaborate with reputable service providers who understand and value our guests as much as we do. Simply by planning ahead you’ll get more from your holiday. Save time and money too. Moroccan style of house, concealing a courtyard garden. Typically, a refreshing fountain flows amid fruit bearing trees in a simple symmetrical layout. Windows face inward. Arched doorways, ornately carved wood and plaster adorn the upper walls and ceilings. Mesmerising tile patterns in dazzling colours decorate the floors and walls, creating an almost overwhelming feast for the eyes. Many historic riads in the medinas of Fes, Marrakech and Essaouira have been converted into guest houses bursting with character. And often boast prestigious pasts. Due to their popularity, these days the term ‘’riad’’ invokes the idea of an unforgettably unique guest house experience. 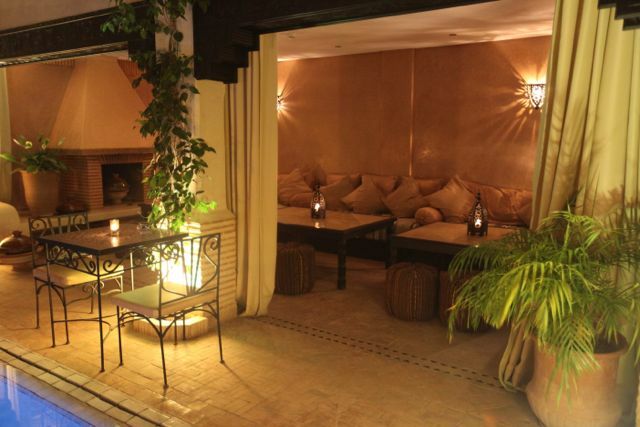 Many might say, a trip to Morocco is not complete without spending at least one night in a riad. An authentic riad experience you’d expect to find in the buzzing medinas of Marrakech or Essaouira. At Riad Dar Haven, there is no need to sacrifice comfort for tradition, you can enjoy both in harmony. Quality new construction has a very natural and modern feel, and features traditional Moroccan craftsman details. Guest comfort is emphasized through well planned plumbing and electrical installations. Quality bedding ensures a good nights sleep, so you’ll wake up fresh and truly well rested. Bathing is a pleasure in freeform sculpted bathtubs especially with our scented artisan bath products. Start your day with a satisfying breakfast then simply relax in our generous communal spaces or get active and explore. Surfing, yoga, golf, hiking, horse riding, camel riding, quad biking, beach and water sports, it’s all literally on our doorstep. Experience Morocco’s cuisine, culture and hospitality ‘’Soussi’’ style. Our small friendly team are here to ensure you have a smooth and enjoyable stay. We really enjoy helping you make the most of your holiday; whether that be simply giving directions, organising activities, general advice or recommendations, just ask. We pride ourselves on delivering good value and hope our guests feel at home. Many guests return and it’s always a pleasure to welcome friends and family of previous guests.